In a spectacular nighttime launch from Space Launch Complex 2 (SLC-2) at Vandenberg Air Force Base in California, United Launch Alliance’s penultimate Delta II rocket successfully lofted the newest and most advanced weather satellite in the National Oceanic and Atmospheric Association (NOAA)’s fleet into polar orbit early this morning. The launch carrying the first of the Joint Polar Satellite System, or JPSS-1, which had been previously delayed due to a battery issue, and then twice again earlier in the week due to various technical, weather, and range issues, provided a dramatic sight that was visible across central and southern California, as well as parts of Nevada, Arizona, and Baja California. Laura Maginnis, ULA vice president of Government Satellite Launch, said after the launch: “It has been an honor to partner with our teammates at NASA and NOAA in launching this critical Earth-observation mission. Together, we were able to overcome multiple challenges in the last two weeks, culminating in the successful delivery of JPSS to orbit today. 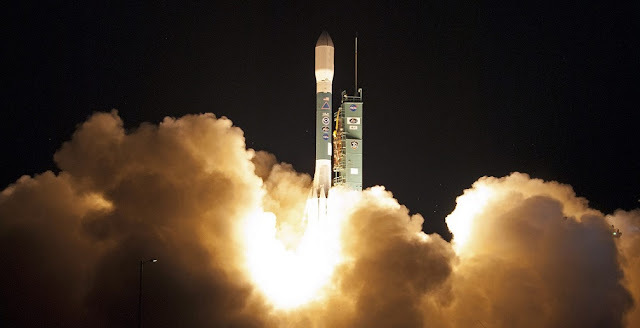 The Delta II rocket, with the 14.8-foot (4.5-meter), 5,060-pound (2,295-kilogram) satellite secured snuggly in the rocket’s 10-foot (3-meter) diameter fairing, lifted off into the darkness at 1:47 a.m. PST (4:47 a.m. EST / 09:47 GMT) leaving behind it a brilliant, fiery trail in its wake. The rocket is a Delta II in the “7920” configuration: “7” indicating the 7000 series which utilizes an RS-27A engine in the first stage; “9” is the number of solid rocket (GEM-40) boosters; “2” indicates the second stage with an AJ10 engine; and “0” denotes no third stage. JPSS-1 is a state-of-the-art satellite that will provide NOAA with the capability to not only observe the current weather but also be able to create superior weather and climate models, including those for hurricanes and other severe weather. This could allow NOAA to be able to predict the development and path of these destructive and deadly storms from five to seven days in advance which could prevent countless injuries and fatalities due to them. The five suites of advanced instruments on JPSS-1 will allow the satellite, which orbits at an elevation of 512 miles (824 kilometers) above the Earth and circles the planet 14 times each day, to obtain two full images of the entire planet each day. This data will be collected in multiple wavelengths of the electromagnetic spectrum including microwave, infrared, radiant energy, as well as the standard optical. The data will provide researchers and the public with a wide range of information not only in all of the primary layers of the atmosphere but also on the land and surface of the ocean. The instruments are capable of advanced monitoring of the environment including temperatures from a wide range of areas as well as detecting the concentration and movement of pollution, smoke, and ash from volcanoes and wildfires, as well as the amount and location of ozone production and concentrations, wind speeds, and even observing nighttime city lights. The JPSS-1, which will orbit in a 50-minute delayed orbit to the Suomi NPP satellite which was launched in 2011, will spend the next three months in a calibration phase. Once the satellite has completed this phase, it will be re-designated NOAA-20. The spacecraft, in conjunction with the data from the geostationary GOES-16 satellite which was launched last year, should then provide unprecedented views and data of the American weather and environment. In addition to JPSS-1, the iconic Delta II carried five CubeSats: four as part of NASA’s Educational Launch of Nanosatellites (ELaNa) program and one from an Australian university. Known as ELaNa XIV, the collection of CubeSats come from four universities across the country and include RadFxSat from Vanderbilt University in Nashville, Tennessee, EagleSat from Embry-Riddle Aeronautical Univesity in Prescott, Arizona, MiRaTA from the Massachusetts Institute of Technology in Cambridge, Massachusetts, and MakerSat from Northwestern Nazarene University in Nampa, Idaho. The Australian CubeSat is the Buccaneer RRM, a joint project of the University of New South Wales and the Defence Science and Technology Group (part of the Australian Department of Defence). The five CubeSats were launched from dispensers – the four ELaNa XIV mission CubeSats were deployed via the Poly Picosatellite Orbital Deployers (P-PODs) – mounted on the second stage of the Delta II after the JPSS-1 deployment was confirmed.